I love the Basket Bunch bundle SO much! It is just so stinking cute! When I saw it, I knew I had to get it to use for Easter treats for the kids’ class parties. 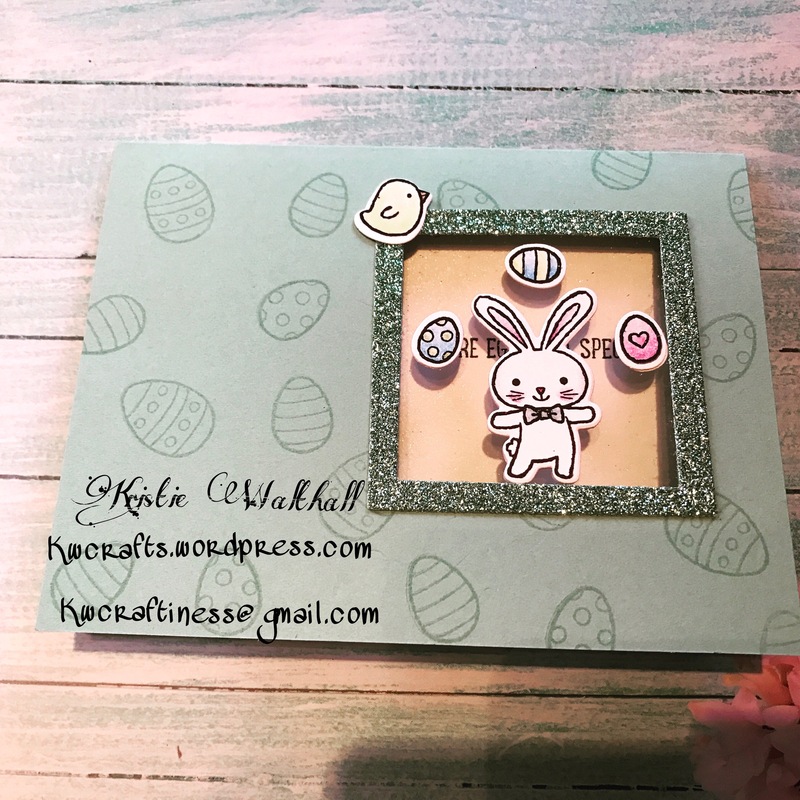 Naturally I completely ran out of time to even start, but that didn’t stop me from making an adorable card that I CASEd from Susan Campfield. I saw it on Pinterest and had to try it. I used Mint Macaron for the base and stamped all those little eggs with VersaMark. The bunny, eggs, and chick were all stamped in archival Basic Black, and colored with the wonderful watercolor pencils. The juggling bunny is attached to a window sheet for a “floating” look, and the window is framed in our gorgeous glimmer Mint Macaron. It was cut out using the stitched framelits. I just love this card and hope the recipient loves it too. Please feel free to leave a comment, and if you’d like to purchase any of the items you’ve seen here, or in any other posts, please visit my online store. I used So Saffron for the base, the Cupcakes and Carousels DSP for layer one, and Whisper White for the top layer. I stamped the tents in stamped off So Saffron. 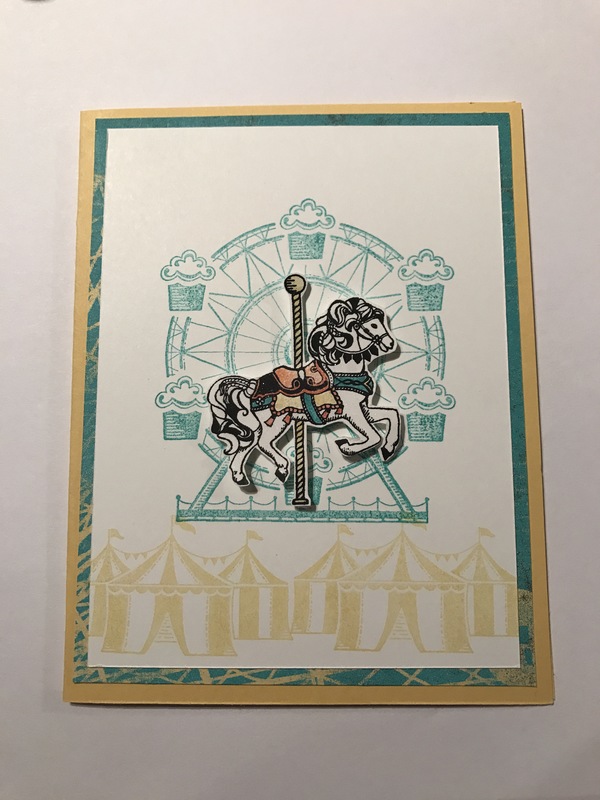 The carousel was done in stamped off Bermuda Bay, and the carousel horse was stamped in archival basic black. He was then “painted” with Wink of Stella pen and So Saffron, Bermuda Bay, and Calypso Coral. I left the sentiment off because I’m using this for a swap. I’d like the recipient to be able to use it for the occasion of her choice, so I’ve purposely left it blank. If you like what you see, please feel free to leave a comment! And if you’d like to purchase any of the items I used for this card, you can pick those up at my online store. Thanks for looking, and as always, happy stamping!